No wonder by night’s end, when that seventh drink is trying to lurch its way up your stomach and/or into the very fibers of your brain, you’re plum out of good ideas as to how to stop it. Yep, it’s that most desperate hour: the hour before you surrender to whatever “sleep” you’ll be getting and wake up with the King of Hangovers as your new master. Is there anything you can do in that tiny interval between you and unconsciousness? To burst the bubble immediately, no, there’s no way out of your hangover. If you drink enough—which is to say more than enough, well into the territory of recreational and/or dare-based consumption—you’re going to feel it. As to what exactly “it” is, hangovers are actually still a bit of a mystery. Sorry, we should clarify: the pile-driving headache, deep shame, and hours of dry-heaving aren’t a mystery. The mystery is the exact cause (alcohol withdrawal, congeners, blood sugar fluctuations, dehydration, immune responses—yep) and our varying predispositions to get them (we’ve all heard someone say “Oh, I never get hangovers!” and then tried to slap them, but were too drunk). Mystery or no, there may be a few ways to mitigate the pain and throbbing of tomorrow morning’s hangover. And when you think about it, why wait for the delirium of the hangover to try to cure it? You’ll end up with a baloney and ketchup sandwich, literally and metaphorically. Of course, before we recommend any of these (without medical expertise, just anecdotal evidence and maybe a couple scientific resources) we also have to echo your junior high health teacher, who probably said, per school board dictate, the best prevention—of a hangover—is total abstinence. Ahem. It’s simple and obvious, but drinking water before you retire for the night (or pass out clutching a sofa cushion like it’s a life raft) should always be a part of your post-drinking regimen. In fact, it should really be part of your drinking regimen, as in between drinks, but that’s for another time. Alcohol’s a diuretic, meaning it dehydrates you. And while it won’t totally demolish the hangover, drinking water might take some of the edge off of tomorrow morning’s headache. Aspirin might help lessen the headache, but if you’re a regular heavy drinker, medications like aspirin could exacerbate any alcohol-induced loss of stomach lining. Yeah. Yikes. When things are desperate, you’re not going to be sizzling up some eggs and toast (and that’s probably for the best—you shouldn’t be near an open flame for…well, a while). But you are able to shove your uncoordinated paw into a box of peanut butter crackers (or cheese crackers, or the vegan variant of your choice). And this isn’t a nostalgic after-school-snack kick (though bonus points for that). Alcohol causes your stomach to produce excess gastric acid, which leads to a lot of tomorrow morning’s nausea, so putting some protein and carbohydrates in there might give that gastric acid something solid, literally, to focus on. *Ironic Twist: Alcohol can inhibit your body’s ability to absorb protein (plus a bunch of other nutrients), so it’ll be harder to get actual nutrition from the stuff. This is more of a delicious “buffer zone” strategy between your tummy and the impact of alcohol. Oh, the powers of soup. Curer of colds, defier of winter frigidity, vehicle for delicious croutons. And potential helper of hangovers. Sure, salty soup may seem like a bad choice to follow dehydrating alcohol. But according to the Mayo Clinic, having some simple stock or bouillon soup can help your body “replace lost salt and potassium.” Remember to drink water alongside the soup, since most of us are too drunk to make homemade soup after a night out and the canned varieties are like salt licks. And if you wanna kill three hangover helpers with one stone, chuck some oyster crackers and chicken in there. Like stealing electrolytes from a baby. Or small children with diarrhea. And while it hasn’t been totally proven that a loss in electrolytes is a major culprit of a hangover (or that electrolyte levels even differ between every hungover person and every sober person), getting some electrolytes could invigorate your system. 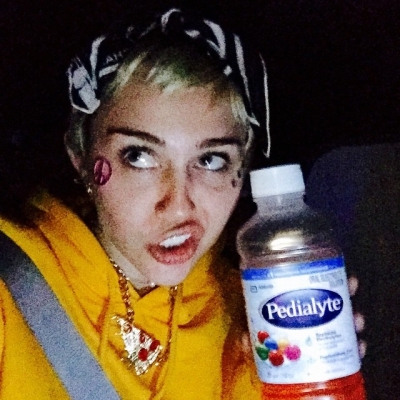 In fact, adults—including Miley Cyrus—make up about one third of the Pedialyte market. And yes, they come in popsicle form. More sentimental fodder for your alcohol-induced-nostalgia. Again, putting pills into a system that’s been dealing with alcohol toxins for the last several hours isn’t necessarily the best method. But the Alcohol Hangover Research Group—and yes, thank god, there is such a thing—actually found that at least part of your hangover might be caused by cytokines, part of your body’s natural immune response that cause inflammation. As Wired reported, sober subjects injected with high levels of cytokines actually began showing symptoms of a hangover. So if a hangover has to do with inflammation, an anti-inflammatory like ibuprofen might be a good, scientifically-backed last ditch remedy. Try to stay awake an hour before you actually go to bed—without having another drink, we should add. For one thing, staying awake an hour (or three) before you go to bed means you’ll have time to drink water, take your medicine, eat your fistful of crackers, and/or chug some Pedialyte. Depending on how much you drank, you may start to feel symptoms of your hangover then and there, but that means less to go through in the morning. Of course, if you drank a lot, you’ll probably still feel pretty drunk, and a hangover—no matter what you ingest tonight—is on its way.